Wallflux Clearinghouse removes click tracking from e-mails by replacing tracked links with their final destination. (Auto-)forward e-mail containing click tracking to clearinghouse@wallflux.com. 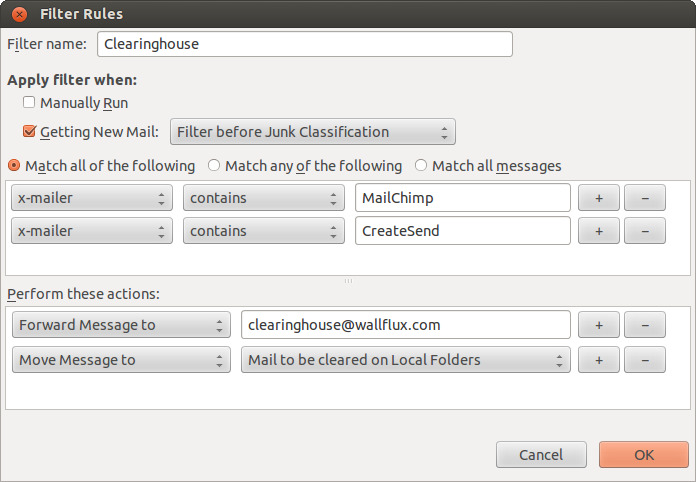 Wallflux Clearinghouse will erase the click tracking and reply with the cleared e-mail message. This e-mail was sent by the Rathenau Institute, a Dutch institute which advices on science, technology and society. You can try Wallflux Clearinghouse yourself by pasting tracked e-mail into the #webservice. Note! By sending/forwarding e-mail to Wallflux Clearinghouse you agree to receive e-mail from Wallflux Clearinghouse. The easiest is to forward mail with tracklinks directly when it arrives in your mailbox. This way, by the time you'll read your mail, all tracklinks are already removed. To achieve this, you must be able to use advanced filtering on your mailserver. Here we share with you how to forward tracked mail to Wallflux Clearinghouse for a few different email providers. Please share with us if you know of a method/service still missing! We have developed a GoogleApp-script especially for forwarding mail from MailChimp, MyClang and Create Send to the Wallflux Clearinghouse. The script can be modified to filter on other linktrack mailers, or to forward to Clearinghouse image service. You need to give GooglApp permission to access your Gmailbox and set up a 'trigger' which runs the filter every hour or so. Follow the instruction which are written at the start of the script. For improved security, you can also download the script and upload it to your own google drive'. After you verify & trust the workings of the script (and it isn't very complicated!) connect it to your Gmailbox. This way you're sure nobody, also not Wallflux, has access to your email. While you're at it, you should disable automatic loading of images as "In some cases, senders may be able to know whether an individual has opened a message with unique image links". If you're not turning of images, and you're not proxying requests to "http://gallery.mailchimp.com" you will still be tracked. Learn how to choose whether to show images here. One final remark on Google; you might sometime receive an error email like this one. It seems you can safely ignore it, but don't hesitate to contact Wallflux if you have reason to believe otherwise. Create a new filter in Tools > Message Filters. Then filter on for example MailChimp and CreateSend, have the messages automatically forwarded to clearinghouse@wallflux.com, and move it away from your Inbox into a dedicated folder. Advanced filtering seems not possible. There is an advanced filtering method available, called Sieve. Personally, we haven't got experience with Sieve (you're supposed to have access to a Sieve-compliant mail server). Any tips are welcome! You've probably received emails with click tracking, with links looking like this: twitter.com/RathenauNL Hover over the link to see! If you now forward email containing such click tracking to clearinghouse@wallflux.com, you'll receive an immediate reply with the same message, but with click tracking removed. Click tracking is about links which suggest to lead to one Internet-address, but first lead you past another, in order to track your visit. For example; the link above suggests to go to Twitter, but in fact it links to http://Rathenau.m13.mailplus.nl/ctt13686943/12345. Although such a link in email sent to you immediately redirects to the target Twitter-address, your brief visit to the specially crafted mailplus.nl-address allows the sender of the email to register that you clicked the link in their email. These links are tracking enabled links. By serving you emails with such links, a sender is able to monitor which links you visit. The mailinglist-provider collects information about your interests. And as they (obviously) already have your email address, it is affecting your privacy on the web. Almost every email in marketing campaigns contains click tracking; Each click on a link in such mail is tracked. By tracking, marketeers build a rich profile of your interests. This is valuable information for marketing purposes; mostly for trying to sell you stuff, but government-run organisations also harvest user-profiles. You can recognize link tracking by the long lists of apparently random character and the unfamiliar domain name, such as http://placeholder.cmail3.com/t/d-l-fcjkd-xirwtkj-o/. In this example, cmail3.com is the domain of the linktracker, and the apparently random characters aren't random; they identify you and your email. The tracker knows which links were sent to you, and where they're supposed to send you next. For a regular user it is often not easy avoid being tracked; In order to find out where a link leads, you need to follow the link, but as soon as you click it, the sender will know you did so, and stores your interest in their CRM database. Obviously, there are privacy concerns at play; At Wallflux we like to keep our interests private. Whether or not we open a mail, or we check a link in a mail sent to us, is no-ones' business but our own. We understand the interest of marketeers, but this interest is not shared. Forward email with tracklinks to clearinghouse@wallflux.com. You get an immediate reply with click tracking removed! You can have emails automatically cleared of click tracking by setting up a filter which automatically forwards messages with click tracking to clearinghouse@wallflux.com. You could automatically forward all emails which have the header x-mailer: Create Send or x-mailer: MailChimp to the clearinghouse-address. We've published a googleapps-script which auto-forwards click track mails from gmail; Read more. Of course, the marketeer who tries to track you, registers all links your email as clicked. But as this is a 100% automated process from the Wallflux-server, this is useless tracking data froma marketing perspective. The Wallflux Clearinghouse-service works best when you auto-forward all mails containing tracklinks, so regardless if you're interested or not. If you just delete uninteresting messages and only submit the interesting ones for cleaning, the marketeer could still register that links on eg. gypsy music create more interest from your email address than links on trash metal and stock options. What if YOU use MailChimp, Clang, etc? From a sender's perspective its understandable to choose for click tracking email service, such as MailChimp, with all the insights it provides on the impact of your mailings. We hope that you can also understand that such tools are less obvious from a email-privacy point of view. There are plenty of alternatives to reach your subscribers by email. Many CMS-systems already have build-in mailing tools (make sure that tracking is disabled!). You can also send your email list using a regular emaillist, such as Mailman. If you agree that email is private, you need to get to terms with the fact that its okay not to know exactly where, how and when your subscribers read your email. Find a way to filter mailchimp mails in eg. gmail Done! Do the same for trackimages Done! ...and for web links! Done! Wallflux Clearinghouse is developed at Wallflux. Please send us feedback if it works, about weird looking emails, about your email filter rules & providers, about click tracking, etc. Thanks! Wallflux Clearinghouse removes click tracking by replacing tracked links with their final destination. store result for at least 14 days. Note: For performance reasons, the Wallflux Clearinghouse webservice processes only a limited number of links and images. Wallflux Clearinghouse removes linktracking by replacing tracklinks with their final destination. We understand that you might have concerns forwarding your email to Wallflux Clearinghouse. If properly set up, however, you'd only forward emails which come from public email-lists. These mails should be of limited personal value to you. At the same time, we assume that at Wallflux, the information which we do receive, is significantly less exploited, and in better hands, than the information which begets in the hands of corporations which pride thmeselves in sending over 1 billion tracklink-enabled e-mails, monthly. At Wallflux we monitor the usage of the service. For this purpose we keep log-files with email addresses and ip-numbers. If you would like to know which information is stored about you, don't hesitate to contact us. By sending/forwarding email to Wallflux Clearinghouse you agree to receive email from Wallflux Clearinghouse. If yo unever want to receive email from Wallflux Clearinghouse, let us know, so we can block your email address. Besides the regular Wallflux Clearinghouse, we also provide clearinghouse-images@wallflux.com. This email-address returns emails cleared and with all images inline. In order to achieve this, Wallflux Clearinghouse tries to downloads all images <img src=...> linked in the email and attaches the images directly to the mail instead. Often, messages contain very small images, 1x1-pixels, so called web bugs, specially designed to check that a user has accessed the content. The benefit of this adtional Wallflux Clearinghouse service is that a mail with images attached can't be tracked by monitoring embedded images, as there are no more external images! The main disadvantage is that emails with all images attached get considerably larger, easily >0.5Mb/mail. So we only recommend to use this service if you have a large mailbox, if you have a strong interest in mailbox privacy, or occasionally, for specials. If for any reason we can't download an image, it will be removed from the email and you'll see a placeholder-notice instead. If there's any other externally linked resource which you have reason to believe could be used as web bug in email, and which could be replaced by inline attachments, let us know!